Many people who live in Michigan have been dealing with faulty sump pumps lately, due to heavy flooding in dozens of areas throughout the state. Downriver, we were hit by more than five inches water in August alone, causing hundreds of sump pumps to fail. When this happens, you will most likely notice a large amount of standing water in your basement. A malfunctioning sump pump can be a very costly problem if you don’t take care of it right away. Since these machines can be very touchy, it’s best to leave repairs to the professionals so it can be done properly. If you live in Downriver, MI it’s easy to decide who to call. Downriver Plumbers is your #1 resource for major plumbing repairs, including sump pumps. 1) Incorrect installation – if a contractor failed to follow manufacturer’s instructions, your sump pump may cease to pump water. Some of the most common oversights can include surrounding the device with dirt (it should not come in contact with any debris) and failure to install a check valve on your discharge line. 2) Defective device – occasionally, sump pumps can be manufactured poorly, so check your warrantee paperwork to find out what the terms are. If it is covered and it is determined to be defective, you may be entitled to the replacement cost of a new one. Downriver Plumbers has the skill and expertise to assess your sump pump and establish whether or not it is defective due to manufacturing. 3) Discharge line obstruction – if your discharge line is clogged for any reason (such as leaves or debris) or is frozen, your sump will fail because water will not be able to properly pass through. There are several other causes for sump pump failure such as poor maintenance and power outages. Once plumbing specialists such as ours investigate the source of failure, they can begin the repair process and get everything back on track again. As soon as you detect a problem in your Michigan basement, and suspect it may be due to the sump pump, you should call Downriver Plumbers immediately. If you ignore it and let it go, your problem could significantly worsen, resulting in potentially high damages and costs. Our goal is to tackle your emergency as quickly as possible, to avoid such an unfortunate situation. No matter where your home or business is located Downriver, we pledge to arrive at your property in just 30 minutes. You won’t have to wait days or weeks to schedule an appointment – we know the severity of sump pump problems and the importance of dealing with them promptly. If your sump pump shuts down, you don’t have a whole lot of time before water starts backing up in your basement. Downriver Plumbers is recognized as the area’s #1 full-service plumbing company, able to perform any major commercial or residential repairs, as well as replace defective equipment. Our company is licensed and insured, so you won’t have to be concerned with anything. Not only will we process all of your insurance paperwork, we also work with you on financing and payment plans so your plumbing repairs will fit within your budget. 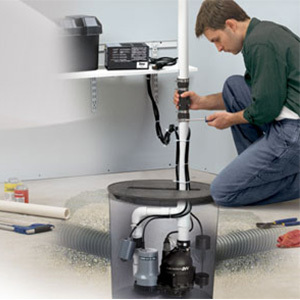 To learn or about how our plumbing specialists can repair your faulty sump pump Downriver, visit our website at https://plumbersdownriver.com. Call us today at 734-548-9925 if suspect any major plumbing problem at your property – we guarantee we will fix your issue and help put your mind at ease.